I think I might be a special-needs parent. I don’t mean to say I have kids with specific problems, though they do have quirks enough between them, I mean I am a parent who has special needs. 1. The next time we were all together and in the company of somebody extra who had opposable thumbs, we could all bunch together and ask them to take a photo for us. 2. Then I could put the picture on a USB stick. 6. Then I could take the completed form to kinder to be stuck on the wall with everyone else’s. Unfortunately, I never accomplished Step One. Whenever we were out with friends and family, there were always so many interesting and exciting things going on that I never managed to remember to have a photo taken. But I did become very good at remembering to do it at three o’clock in the morning afterwards. And I haven’t even told you the most embarrassing part yet. I was supposed to do this at the start of the year. Throughout the first few weeks of Term One, everyone else’s All About Me forms were plastered all over the wall in the Home Corner, complete with cheerful, glossy photos. That wall haunted me. After several weeks of trying and failing to procure a photo, I finally decided I’d missed the boat and getting the form in now would just be embarrassing. A few months later, a second All About Me form came home, complete with a blank rectangle for the family photo and a little pink post-it note asking me to fill it out and bring it to kinder. In a guilt-fuelled frenzy I took action and quickly set about forgetting to get the photo taken all over again. Then, in Term Two, Annie turned three and started kinder in the younger group. 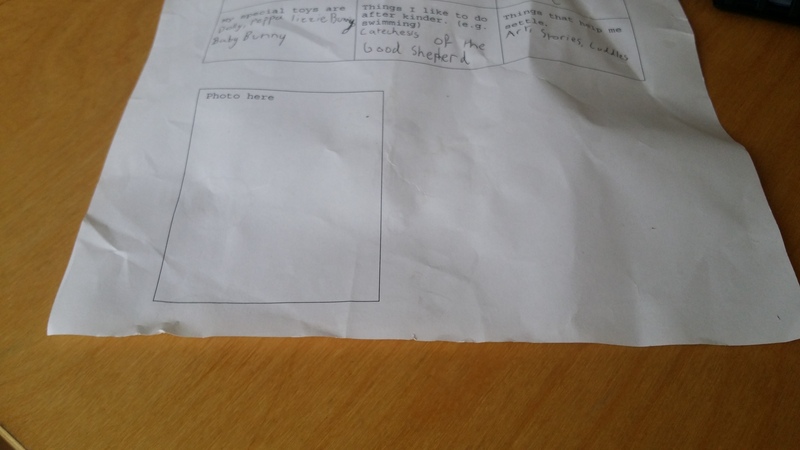 Annie was also given an All About Me form, with a blank rectangle for the family photo. I now possessed two All About Me forms (three if you count the original) and zero family photos. And my ability to perform a series of straightforward and simple tasks did not seem to be improving. But things were looking up. When Christopher Robin made his First Communion, we had a family photo taken, all in our Sunday Bests and by a proper photographer (well, he was one of the dads, and he was doing it for free, but it was a way of making up for not being allowed to take pictures during the ceremony and he did have some pretty impressive equipment). At last, we would have a proper whole-family photo and my nightmare of shame would be over. And not a moment too soon. When I went to kinder for the parent-teacher interview, Annie’s kinder teacher made a polite enquiry after the much-overdue family photo. She was really kind about it actually. To spare my feelings, she made it sound like this was a new request and not something they had been wanting for the past six months or so. Here’s the thing: it turns out all of the family photos, no longer on Kate’s Wall of Disgrace, were now mounted on bits of cardboard and compiled into a special book, sitting in the library corner. The teacher showed it to me. All of the children loved to look at this book and find the page with their very own family. Plus it achieved all sorts of developmental outcomes about Belonging and Sense Of Self and something about Affective Cognitive something-something Relationship. I’m pretty sure my two children were the only orphans with no special photo page. But it was OK. I reassured the kinder teacher that said photo had now come into being and all I had to do was get my hands on it and print it out. She said I could even email her a digital copy and the kinder would print it off (how bad did that make me feel? Like most kinders, ours is a struggling not-for-profit with little in the budget for coloured ink or photo paper). Also, Matilda’s and Christopher Robin’s homeschool co-op had put in a request for family photos to be emailed around, just so we could match everyone together and see which kids belonged to which parents. It was a great idea. I was so glad to have that photo at last. Except I didn’t actually have it yet. After a few weeks of waiting, I worked out I was actually supposed to bring a USB to the co-ordinator of the Catechesis of the Good Shepherd (the group Christopher made his First Communion with), so I could download the photos from her computer. Which would have worked, except Catechesis was now on break and I wouldn’t be seeing the co-ordinator for a few weeks. But it was OK, because kinder was also on holidays. By the time kinder started, I would be able to return Annie’s and Harry’s portfolios complete with the family photos, if not the All About Me forms (they were all a little worse-for-wear with food stains and torn edges and, in one case, a small footprint). I sent the co-ordinator a message and asked if she could perhaps find the one whole-family photo and email it to me. She responded promptly and said she would look it up and send it to me right away. Which was great, except I sent that email over a week ago and I still haven’t heard back from her. There is a whiteboard in the foyer at kinder with a list of the names of families who are overdue in returning their portfolios. All of the other names are gradually disappearing, but ours remains. I probably should chase up the Catechesis co-ordinator for her email, but I can’t bear the thought of making another person feel bad for forgetting to send in a photo. I also thought about taking a family selfie in the bathroom mirror, but that would require cleaning the bathroom and that thought just depresses me. Tonight, though, things are going to change. We’re all going to my mum and dad’s for dinner and I’m not going to get sidetracked this time. I’ve put several alarms in my phone and I will ask everyone there to not let me leave without a family photo in my phone. We will finally have a proper picture of the whole family we can use for all our kindergarten and co-op needs. At least for the next two weeks before the twins are born and it immediately becomes obsolete. This entry was posted in Fail., Misadventures in Motherhood and tagged anecdote, fail, family, forgetfulness, guilt, home, homeschool, humour, kinder, lifestyle, motherhood, parenting, pregnancy, preschool, sahm on July 24, 2015 by katelikestocreate. This is embarrassing. I came up with the idea for 10 Short Takes ages ago, thinking it would become a regular thing (not just for me, but for the entire internet). And then I just sorta forgot about it. But now I’m going to take it out and dust it off, because I thought of something else I could do with it. So here are 10 Short Takes on my magnificent five-year-old, Harry. Harry does not enjoy dressing up. Remember Book Week? 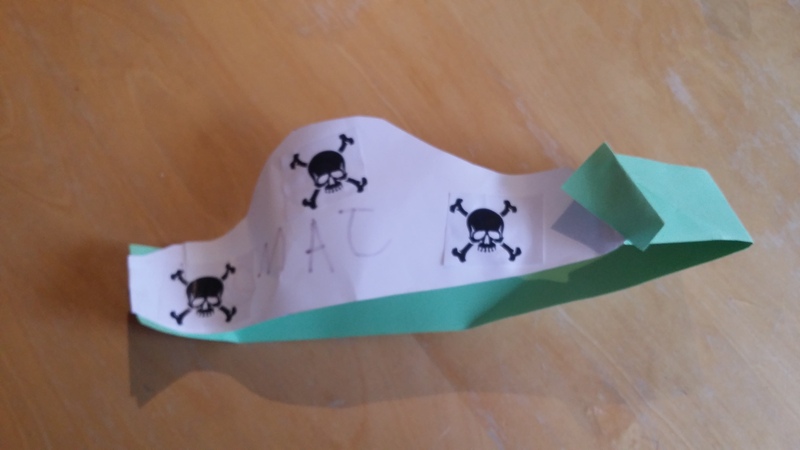 Recently, Harry’s kinder did a pirate day. I tried to tempt him with skull bandannas and stripy tops, but Harry politely declined and insisted on his faithful dinosaur t-shirt/tracksuit pants ensemble. When I came to pick him up at the end of the day, Harry was the only one not sporting a cardboard hat and/or eyepatch. He was just Harry. Harry worships his daddy. Daddy features in most of Harry’s pictures and the only dress-up in the box Harry is interested in is an old, white business shirt. When Annie wears this shirt, she is a doctor or a rocket scientist. When Harry wears it, he is only ever Daddy Going to Work. Harry loves clocks. For a while, he took to wearing an analogue watch with no batteries. Whenever he entered a room with a clock on the wall, he would adjust his watch accordingly. 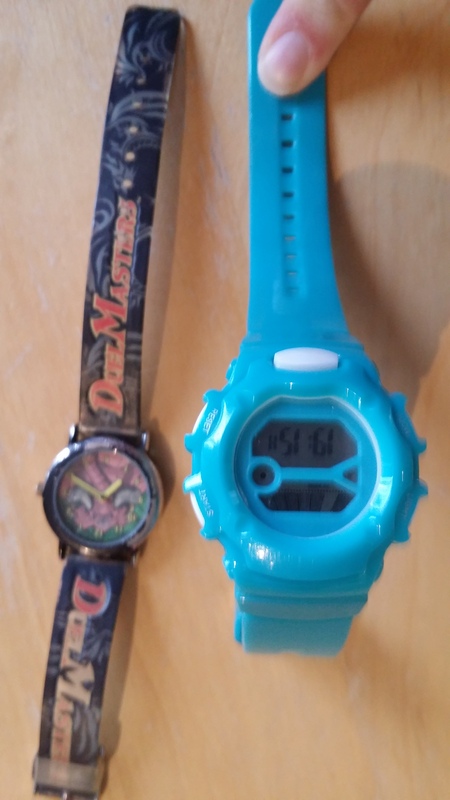 For his birthday, Harry’s grandparent’s gave him a proper watch with batteries and everything. It’s digital and the screen can light up in different colours. This is the joy of Harry’s life, although he still wears the dead analogue watch sometimes, for old time’s sake. Harry’s uncle also likes clocks. He has a collection of expensive watches from Japan. Harry enjoys sidling up to Uncle Greg and comparing watch features (Greg’s watch has GPS, Harry’s watch can make a cool beeping noise). I think Greg enjoys this too. Harry’s favourite television show is Letters and Numbers on SBS. Harry and Annie are fast friends, though polar opposites. Annie is quite assertive and extroverted and loves to perform to a crowd. Harry is introverted and can take a while to warm up to people he doesn’t know. When Harry is feeling out of his comfort zone, he sticks with Annie to feel safe. Harry and Annie are also partners in crime. Recently, I caught them out. Annie had helped Harry to push a stool into the pantry. Harry climbed the stool to access a miniature green tea Kit Kat from a bag of treats Uncle Greg had brought us from Japan. This he promptly unwrapped and snapped in two, giving half to his sister.I probably should have told them off more, but they were so darn cute solemnly munching their spoils that my heart just wasn’t in it. Harry’s favourite colour is dark brown. Harry does not like noisy crowds. When amongst loud strangers (or, indeed, loud friends and family), Harry will either sit quietly with his hands over his ears (a gesture Annie will often imitate, assuming she hasn’t managed to command the crowd’s attention so that she can sing them her favourite song), or find someone he trusts to answer his maths questions. Crowds can be unpredictable and loud, so it’s comforting to know that five plus two is still seven, regardless. This entry was posted in 10 Short Takes, Misadventures in Motherhood and tagged 10 short takes, anecdote, children, family, five-year-old, humour, kids, kindergarten, motherhood, parenthood, parenting, preschooler, sahm, son on July 15, 2015 by katelikestocreate.